Donald Carter remembers the first shot of morphine he took in Vietnam after shrapnel ripped through his right eye. Another vet, Chuck Webb, talked about his descent into drug addiction, which started with physical abuse from his father and continued through a troubled life. Both vets fell deeply into substance abuse, which plagued them for most of their lives. It was not until they both found Shepherd’s Heart Veteran’s Home that they were able to come to terms with their problems and begin to rise above them. “My life has had a dramatic turnaround because of Shepherd’s Heart,” Webb said. This organization, operated by Shepherd’s Heart Fellowship, has not only enabled them to stay off of drugs, but it has helped them with employment and has given them the necessary life training skills. “The aim of Shepherd’s Heart is to restore honor and dignity to those who have served our country,” Rev. Michael Wurschmidt, executive director of Shepherd’s Heart said. Since 1993, Shepherd’s Heart Fellowship has been serving homeless veterans by providing them with food, shelter, information and referral, case management, other resources and hope. 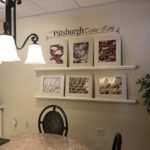 Located on Pride Street in Pittsburgh’s Uptown neighborhood, Shepherd’s Heart has a 75% success rate of homeless veterans who have completed the program, met their personal goals and have reintegrated into society and obtained permanent housing. Shepherd’s Heart serves other homeless people in Pittsburgh and at their Drop-In Center, approximately 50 -100 people are served daily as they receive breakfast, counseling, information, referral, encouragement and love. These homeless people are allowed to take showers, wash their clothes and they are given additional clothing if needed. “We are all enriched and encouraged as we serve,” Rev. Wurschmidt said. After he fell in love with his childhood sweetheart, Carter and Sharon Weir became parents at 14, and right away Carter knew he had to work to take care of his son, Shawn. He took a job as a laborer at an asphalt plant in Pittsburgh where he made $68 every ten days. “It was a dirty, real dirty job,” Carter said. Carter stayed with Weir for a long time after their son was born and he really wanted to marry her but he decided to join the army to build a life. “I figured that the only way I was going to support my son is to go into the service,” Carter said. Carter, a trained paratrooper, soon found himself being shipped to Vietnam. According to Carter, who was also a machine gunner, his platoon engaged the enemy in intense warfare from the moment he arrived as part of the Tet Offensive, one of the nastiest parts of the Vietnam War. A lot of heroes died that day and only three men were left in Carter’s platoon. These heroes stood their ground and did what they were supposed to do. “I saw my captain got killed, my company commander,” Carter said. The fighting on the hill was so intense that his nerves, his senses and every part of his body were alert and he reacted to everything he noticed and felt. Carter explained that this was his protection and fighting on the hill was the ultimate of what he was trained to do. “At 18-years-old that was the worst combat I had ever experienced,” Carter said. After surviving the Tet Offensive and serving in Vietnam for 10 months, Donald Carter was anxious to return home and as he sat on a foxhole talking and laughing with his friend, a supposed friendly fire struck him. “Me and my lieutenant got hit and he lost a hand and I lost an eye,” Carter said. As the shrapnel went through his eye, Carter explained that it felt like someone punched him in his face and he was seeing stars. Carter did not want the doctors to take his eye out but they explained to him that his eye was ripped and torn, so it had to be removed. “Do everything you can to save my eye,” Carter said to the doctors. When Carter returned home from the war, Martin Luther King was assassinated and there were antiwar riots all over the country. “We were baby killers, even though you were proud of what you did,” Carter said. While recuperating, Carter saved money and sent for the mother of his child to come to Hawaii where they could be married. Then he learned that the mother of his child had left him for one of his friends. Carter’s purpose for joining the army was to take care of Weir and his son and now she had disappeared from his life. Carter quickly descended into drugs addiction and criminal activities to support what he was going through. “The only thing I knew to do was to numb my dumb self and try to live like that, numb and dumb,” Carter said. One crime after another piled up until he was imprisoned for several years on drug related charges. He used this opportunity in prison to get off of drugs and seek treatment for post traumatic stress disorder, a malady that was only beginning to be diagnosed in returning veterans. Not only did he find solace, but his lawyers helped force the Pennsylvania Department of Corrections to treat returning veterans in prison. “That helped me and that’s what brought me back to my sanity,” Carter said. Carter was released from jail in October 2006 after 25 years behind bars. After a short relationship with another woman, ended badly, rendering him homeless, Carter found Shepherd’s Heart, a home for veterans in December 2011. He heard about this organization and he wanted to take advantage of it so he could get the help and support that he needed. Shepherd’s Heart has provided Carter with a home where he can receive daily meals and he has learned how to control his finances. At 65, Shepherd’s Heart has helped Carter tremendously and he now has a job and shortly he will be moving into his own permanent residence. Carter has saved enough money to move into his own apartment, so that he can be free to enjoy life and take care of his own responsibilities. Webb followed much the same path of drug abuse and crime until he decided to join the military in 1976, just after the Vietnam War. “The service was a fantastic experience,” Webb said. He returned from the service in 1979 at 20-years-old, with three years of military experience. He went on to attend Calvary Christian College and Seminary where he obtained a Bachelor of Science in Biblical Studies and he also took computer classes. Webb then moved to Aruba, where he taught at a local university and then to New York and Pittsburgh where he got involved in drugs. In 2008, Webb was arrested and sentenced to 17 months in prison. After his release he was at risk for homelessness because he was sent to the halfway house. “When they sent me to the halfway house, by this time I had come to my senses,” Webb said. Webb really wanted to become a drug and alcohol counselor, so he went to the Veteran Affairs (VA) hospital to inquire about this position. A gentleman at the VA hospital told him that he would try to get him in a program called Shepherd’s Heart. As a resident at Shepherd’s Heart, Webb explained that he had his own bedroom and lived in a community with 14 other men. They met regularly with case workers and learned to develop appropriate relationships again. They had meals together, attended Bible studies and other classes and gained employment outside of Shepherd’s Heart. “Everything that I am I owe to God through Shepherd’s Heart,” Webb said. According to Webb, it is ironic how everything he thought that he was going to get at a program in Lebanon, Penn. that would help him get a job, he did not get, but he got so much more by coming to Shepherd’s Heart. Webb is currently the Supportive Service for Veterans and Families case manager at Shepherd’s Heart. He explained that he has a rag to riches story and he was honored to represent Shepherd’s Heart at the Pittsburgh Social Venture Partners, where he won $20,000 for the Veterans Home. He gave a three minute speech about Shepherd’s Heart, which gave him first place. According to Webb, the veterans at Shepherd’s Heart are encouraged to save their money and they are given wise financial advisement. Last year, Webb bought a new house and got married to his wife Sharon. “The tremendously divine thing about it is that God has a plan for us and so many times we even try to run from that plan,” Webb said.